Stunning four-bedroom home in Charming Winhall, VT. Beautifully furnished, fully appointed newer house comfortably sleeps 12. Enjoy mountain views while cooking in the gourmet kitchen, dining at the large country table, and relaxing in front of the stone fireplace. Comfortable library on the main floor is the perfect place to snuggle up with a blanket, a book, and a beverage. 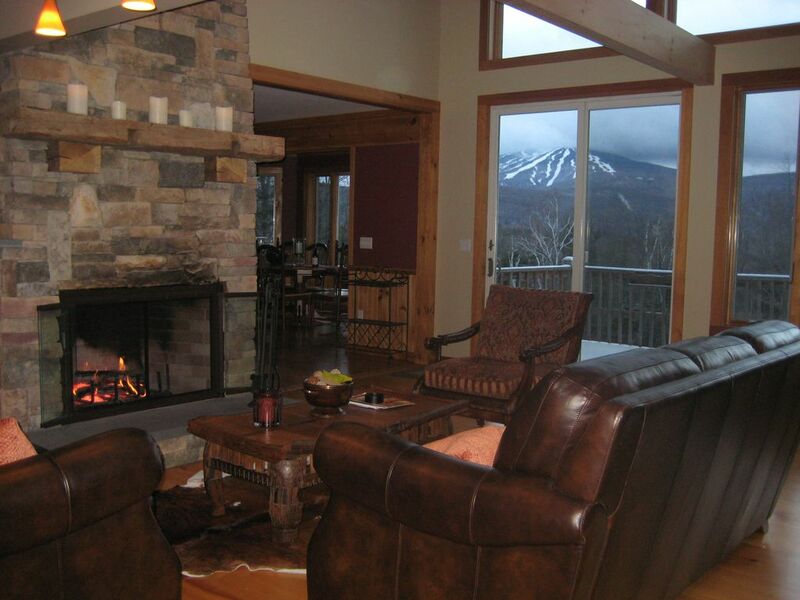 Floor-to-ceiling windows on the main floor offer stunning views of Stratton Mountain from any vantage point. Large deck on the main floor overlooks the rustic backyard and mountain. Master suite offers king size bed, bathroom with a Jacuzzi tub, and a private deck. Kids’ bunk room has a large walk-in closet, two bunk beds, one full size bed, and one twin bed. Main floor bedroom has a queen bed, while the downstairs bedroom has a king. Enjoy the pool table, foos ball, pellet stove, and cozy tv room in the basement. The house offers a spacious two-car garage that enters into the mudroom on the main level. The six-person hot tub is steps away from the backdoor. This house is perfect for 2-3 families. We spent a week at Stratton and was very impressed with this house. The moment you walk in, you see the incredible view of the white trails of Stratton Mountain Resort in the distance. This instantly puts you in a ski vacation mode. Despite it being only a few degrees outside, we felt warm inside the house and we especially liked the heated floors. The house is well stocked with essentials and is well maintained. Our group of 12 was able to easily cook meals and eat together in the spacious kitchen and dining area. In the evening, we rested and chatted comfortably in the great room, which has a lovely fireplace. This is a sizeable house with large bed rooms but yet felt cozy. The walls were thick enough so that the kids can be put to bed and not be disturbed by the adults chatting in the kitchen area and the great room. We spent a few hours in the backyard hill sledding and everyone had a great time. The hot tub was a great place to relax and wind down after a long day on the slopes. We also liked the fact that the TV was downstairs along with the pool table and foosball. That way, the adults can chat/wind down while the kids can be entertained downstairs. The owner Dave was very responsive and was helpful with any questions that we had. We are already talking about returning here next year because of our wonderful experience. We had a great time skiing Stratton. Dave was wet quick to respond to any questions. The house and view were incredible. A quick strive to Stratton. The house was fantastic with ample, clean space. The fireplace is wonderful and the view is beautiful. Love the large open kitchen. Great for groups and families. 2nd amazing stay in this stunning home! We are back for our second visit this season to this gorgeous home! How do you improve on a perfect house? Just can’t!!!!! Read my comments from January 2018. This house is unsurpassed in quality. Stay here for the gold standard in accommodations. As always, many thanks Dave!! This home was amazing with spectacular views, impeccably clean, beautifully furnished, and lots of room for our kids and grandkids! We had a couple feet of snow and the owner Dave was great in handling the plowing. His responses were immediate and he took care of everything!! Our 3 families with kids enjoyed staying at this beautiful property. The house is great, very spacious and well appointed.. it looks exactly, if not better than in pictures . Location was great, about 10 min car ride to Stratton ski area. The owner was incredibly prompt and responsive to all of our requests and inquiries . Would highly recommend this property and stay there again.